Virtual field trips are becoming more accessible as the industry develops further and products become more readily accessible, and intuitive, in the hands of educators, students, and VR evangelists. Google Expeditions and Nearpod are two popular examples of this innovative potential, typically utilized in K-12 settings. Yet, The College of Idaho’s History Department has taken a more direct approach by leveraging a platform named Thinglink to create a tour of the Zhaojue Monastery in Chengdu, China. Dr. Synder Reinke oversaw seven students, utilizing cameras purchased with funds accrued from a Mellon Foundation grant. The Idaho Virtual Reality Council had a chance to discuss the project further and gain insight from a distinguished professor on their thoughts about this emergent technology and its potential both in the schoolhouse and in the discipline of history as well. Initially, a significant challenge in designing the project was deciding which platform through which to create the team’s vision. Snyder-Reinke ultimately decided upon Thinglink for its ability to conjure annotations in a virtual space. The idea was not simply to create a visual space, but an educational space. It was one of the first tours of its kind on Thinglink, and the platform has featured a post by Snyder-Reinke detailing the design and execution of the project in-depth. Ultimately, Snyder-Reinke was seeking to provide his students with experiential learning that was true to The College of Idaho’s vision of the liberal arts. Rather than writing an exhaustive essay, he wants his students to learn about the history of the temple in a hands-on manner after the completion of a two-semester course titled “What is a Chinese Temple?” Synder noted the benefits and drawbacks of projects such as photo-essays, and found that a 360 tour created on-site was perhaps an untouched stone. The result was an experience that students found enjoyable and immersive, albeit technically challenging in some instances. The goal, however, to create a successful learning experience, was fulfilled entirely. 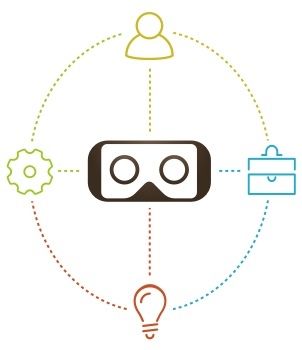 When asked about his stance on virtual reality in the classroom, Snyder-Reinke honed in on what some market analysts have been claiming: There’s great potential in the K – 12 demographic for these technologies to be adopted and to be effective. He is excited to see the potential in secondary education, and yet seems to be in part leading the way. The divide between elementary education and secondary education is marked largely by the exercising of free will. The project that Snyder-Reinke undertook with his students is markedly different than experiences such as Google Expeditions or Nearpod in that students had to work together to create a final vision. Platforms that allow users to create their own experiences, such as Idaho’s own Blocksmith, are becoming popular topics for discussion as the industry continues evolving. Beyond curricular innovation, Dr. Snyder-Reinke is working on a project (Again in concert with the Mellon Foundation, Stanford) to track the displacement of various grave sites in China after the desecration of the Qing dynasty. If you want to read further about the historic and academic nature of this project, The College of Idaho has released an article looking deeper into those components. If you want to learn more about virtual and augmented reality in the classroom, our post about mixed reality in Blaine County is present for your reading pleasure. Thanks for reading, come join us in the metaverse if you are so inclined!